The early harvest apple tree is famous for its small, yellow apples. The reason behind its popularity is its early maturity i.e. a month prior to the peers. The apples are eaten raw and backed. They might appear slightly tart. The plant is hardy, high yielding, grows taller and wider than any other variety. The plant needs a gap of 16 feet from the adjacent plant. In case of the dwarf breed, the spacing can be as small as 6 feet. The soil needs to be phosphorus rich and well drained. A minimum of six hours of direct sunlight must be available to the site. The dwarf trees need to be provided with hedges as support as they are prone to break due to the heavy weight of fruits they bear in its branches. Many greenhouses and horticulture agencies suggest applying mulch to provide the soil with biodegradable compost that will preserve the water and air holding capacity of the soil. Other names of early harvest apples are yellow June and Yellow Harvest. The skin covering the fruit is yellow, but the pulp is white. It is good for cooking and eating without cooking. Most of the apples ripen towards the end of summer, while early harvest apple ripens in June or July. When the apple ripens, it usually develops an orange blush on half of the orb. It doesn’t last longer after harvesting, so it should be consumed within days. Hence, this is a seasonal fruit. 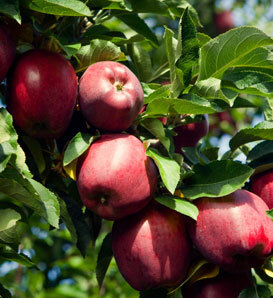 As it ripens towards June and July, it becomes one of the first apples that enter the market as fresh harvested stock. The gap between its harvesting time and other apple’s gives ample time for it to stay at peak in market. When these apples are picked before their ripening, they are used for pies, sauces and bakery.